BOCA RATON, FL — Boca Raton Football Club is excited to announce the signing of former Brazilian National Team, and São Paulo forward Márcio Amoroso, better known as simply Amoroso for the the 2016 APSL Season. Amoroso, known for his time with teams such as São Paulo, Flamengo, Parma, and Borussia Dortmund, and the Brazilian National Team, comes to Boca Raton as he looks to invest in the ever-growing game here in the United States, and more specifically Boca Raton. Looking to leave his mark in the sport here in the United States, Amoroso’s goal isn’t to simply play for Boca Raton, but to be an ambassador of the club not only in the US, but to the world. The 5’11 forward began his career at Guarani FC in 1992. In the 1994 Campeonato Brasileiro Série A he was the tournament’s top scorer. In 1996, he transferred to Flamengo, but he came to prominence playing in the Italian Serie A for Udinese in the late-1990s. When top scorer Oliver Bierhoff left the club for A.C. Milan in 1998, many thought Udinese Calcio would struggle to repeat their success, but that very next season Amoroso himself became the focus of the team, and was the top scorer in Serie A with 22 goals. The following season, he transferred to the defending UEFA Cup and Coppa Italia champions Parma. In 2001, Amoroso made the move to Bundesliga-side, Borussia Dortmund, where he spent three years and scored 28 goals, in his first season with the club he helped the team with the Bundesliga title and was also the league’s top scorer. The following season Amoroso led Borussia Dortmund to the 2002 UEFA Cup Final. Amoroso moved to São Paulo in the summer of 2005 and helped them to the Copa Libertadores, as well as a FIFA Club World Cup, where he finished as the tournament’s top scorer. Amoroso is also a former Brazilian National Team member, where he debuted in a 5-0 win over Chile in 1995 and was an integral part of the 1999 Brazilian National Team that won the Copa America in Paraguay that year, Amoroso scored four goal in the tournament, only second to Rivaldo and Ronaldo who both scored five. 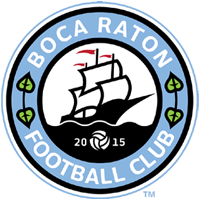 Amoroso will debut with Boca Raton FC in their matchup versus Hurricanes FC at Broward College on July 9th at 6pm. Tickets can be purchased at www.bocaratonfc.com/tickets.